This major primary source database contains nine file series which span four major 20th century conflicts – the Spanish Civil War, the Second World War, the early years of the Cold War and the Korean War. Files are sourced from the Permanent Undersecretary’s Department (PUSD) – the PUSD was the point of liaison between the Foreign Office and the British intelligence establishment – Joint Intelligence Sub-Committee, War Cabinet, Cabinet Office and Ministry of Defence. One of the highlights of the resource, the HW 1 series, consists of original intelligence reports from German, Japanese, Italian, and other nations’ signals, that were intercepted, deciphered, and translated by the British Government Code and Cypher School at Bletchley Park. Covering the period 1940 to 1945, the HW 1 files include reports derived from high-grade cyphers such as ENIGMA. 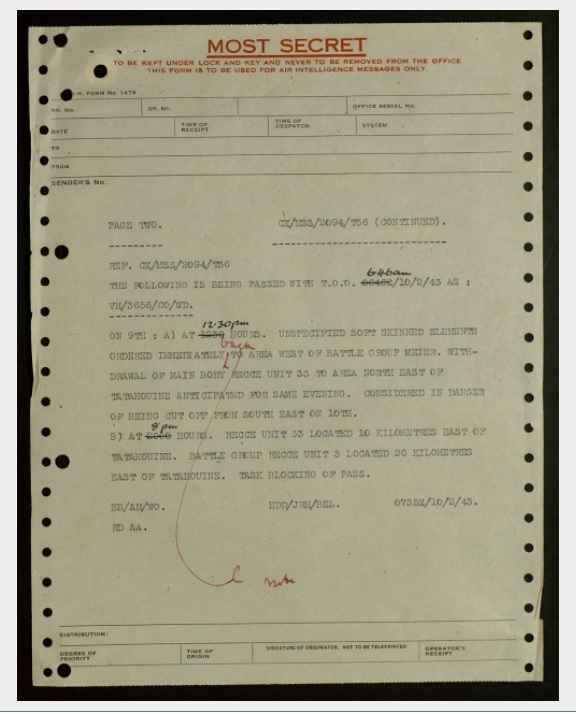 These reports were delivered to Winston Churchill in batches several times each day throughout the Second World War, and in many cases include Churchill’s own handwritten annotations in red ink. Screenshot of page from ‘Government Code and Cypher School: Signals Intelligence Passed to the Prime Minister, Messages and Correspondence’, HW 1/1355, 10 February 1943. From Secret Files from World Wars to Cold War. The database includes multiple search and filter options and a series of essays written by the resource Editorial Board of academic experts that contextualize the material and highlights key themes. There are some online tutorials available to help guide you through the key features of the resource and enabling you to make the most of the wealth of tools available to help discover and view your content. Access Secret Files from World Wars to Cold War via e-resources trials. Access available until 26th March 2018. Please note that the My Archive and the Document and Citation Download functions are not available during the trial period. Documents can be viewed using the image viewer function. This entry was posted in Library, Online resource, Primary sources, Trial and tagged 20th century, archives, Britain, Cold War, Databases, government papers, History, International Relations, official documents, primary source, Spanish Civil War, World War Two by cstirling. Bookmark the permalink.